The story of this testimonial herbal infusion of Wild Mulberry, Cherry and Mint leaves dated back to the Noahs time. It is believed that the Noah planted his first trees, mentioned in the Bible (Mulberry, Wild Cherry) in the valley of Ararat and used the infusion of lives with wild Mint as a refreshing beverage. The “Noah’s Blend” name was forgotten during centuries and people start to used “Christmas tea” and “AMANORYA THURM” ("ama" means moon, "nor" means new, “thurm” means infusion) which are still keep the meaning of previous name of infusion and symbolize the New Year, New Life and New Moon. “Noah’s Blend” was serving as a special beverage for New Year dinner with traditional sweet bread NAZUK and has high antioxidant effects that neutralize the alcohol in the blood as well as improves digestion. Due to the witness of another legend, this testimonial herbal infusion dated back to ancestor HAYK-ORION time at 2492 B.C. According to the tradition, the ceremony table of the NAVASARD celebration should have at list seven food started with the name that has the letter “N”, like Nush (almond), Nur (pomegranate), Ngatsagki Ac (Artemisia bread), Nazuk (sweet bread) , etc., including Noah’s blend, which symbolized the appreciation to Gods. The NAVASARD celebration ("nav"- new, boat, arch and “sard” and its Pagan Armenian New Year that celebrated in August) taken place near Npat Mountain at the Coast of Aratsani River (Murad River in Turkey) and later on the celebration restarted at the Coast of Araks River near to the Ararat Mountain. *The time when David inquired the God, he told not to approach them directly but to turn away, and come upon them "over against the mulberry trees". Then David heard the "sound of going in the tops of the mulberry trees", he fell upon the Philippines, for this was the signal, that God had gone forth ahead of David to smite the enemy. Ingredients: Wild mulberry, cherry and Minth leaves. Directions: Place 1-teaspoon tea per one-cup teapot; add freshly boiling water into teapot and brew for 5 minutes. Strain in to the cup and serve hot or iced, without sugar. 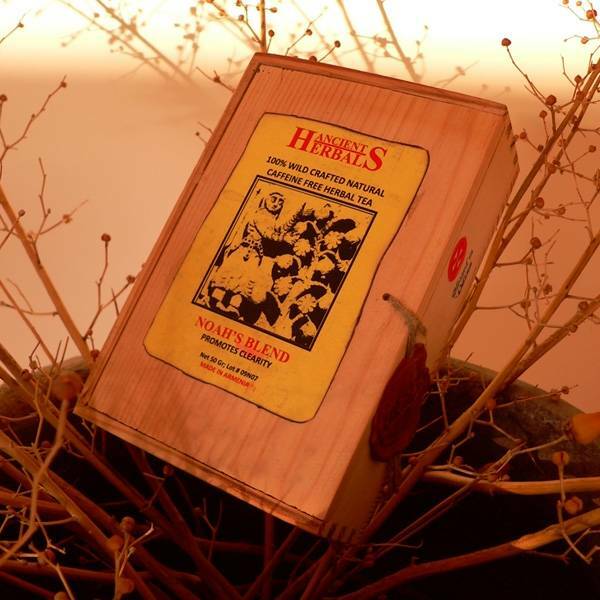 50 gram loose herbal tea in especially handmade treated wooden boxes.